Camellia Society of Santa Clara Inc.
1940 - The Santa Clara County Camellia Society was founded. It originally began as a men's Club for recreation and fellowship with like minded enthusiasts. 1942 - The first Camellia non competitive public show happened. 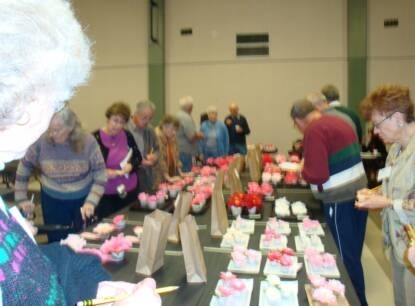 The club numbered 70 strong, and each grower was given a table to exhibit his camellia's. There were almost 2,000 blooms on display and 6,000 visitors. The event was instantly a success! Late 1940's- The membership was opened to women. During this time the exhibits were displayed in the automobile showrooms of the San Jose Ford Sales Company at 375 Market Street. Early 1950's- The show outgrew the Auto Showroom, and it was moved to the San Jose Civic Auditorium for 10 years. Camellia plants were still considered garden exotica. To acquire a set of four original specimens, imported from Asia, would cost around $1,000. The society would pool their money together and purchase a set. Members traded pieces of wood, growing their own whole plants from grafts or cuttings. The plants thrived and the society with it. 1960's - The show moved again to the San Jose City College Cafeteria and had become a competitive show with members entering blossoms to win ribbons and trophies. Competitive showing became the yearly standard. 1976 - The Show again was moved back to the San Jose Civic Center, this time in the McCabe Hall, for the Bicentennial Anniversary of the United States. this show was sponsored by the City of San Jose. 1977 - The Show was moved back to San Jose City College. 1980's - The Show was brought to the City of Santa Clara and the yearly show was held at the Santa Clara Community Recreation Center, in Central Park at 969 Kiely Blvd. where it is held still today. This is the time when chemically treated blossoms began to divide club members, especially those competing for top honors in the show. Some viewed the chemical treatments as cheating, and were demanding natural blossoms to be allowed for claimed prizes. At first, Chemically treated blossoms were separated on and judged separately as a chemically treated category. Judges were forced to become skilled in being able to tell the difference of a chemically treated bloom put on tables with the natural blossoms. the riff between members severely compromised the nature of their show as a fair competitive venue. John Augis, the president of our society at the time, petitioned the Northern California Camellia Society council to allow an "Open Show". At this point judges started judging the blossoms more strictly, putting more emphasis on categories other than sheer size. 1991 - On February 12th, in celebration of the Society's 50th Anniversary, the Santa Clara County Camellia Society presented the City of Santa Clara with a plaque, in appreciation of the city and community's years of support and sponsors. 2009 - The Society still is active with educational meetings, friendship, competition and services.